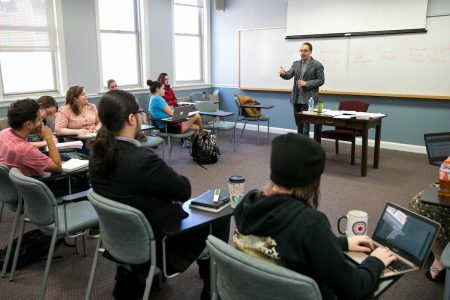 College Values Online has ranked Randolph College’s professors in the top 50 in the nation among small colleges, alongside Brown University, Pomona College, Davidson College, and others. The article considered colleges with fewer than 15,000 students, the school’s academic reputation, student-faculty ratio, and composite faculty ranking on www.ratemyprofessor.com. The complete list of rankings is available at http://www.collegevaluesonline.com/features/small-colleges-best-professors/. This is not the first time Randolph has been recognized for its outstanding faculty. In the 2015 edition of the Princeton Review, Randolph was ranked 20th in “Professors Get High Marks.” In 2013, CBSNews.com named Randolph 13th in the nation for “Best Professors.” And in 2011, the College was ranked first in the nation for “Most Accessible Professors” by Newsweek. Only two other schools in Virginia made the new College Values Online ranking.